The East Anglian Daily Times reported on December 10, 2015 , the passing of “Crawshay Martin Richard Charles : Beloved husband of Grania, dearly loved father of Charlie and grandfather of Thomas and Marina who died peacefully at home on December 5. Martin served as Secretary and Racing Liaison Executive of the Horserace Betting Levy Board(HBLB) for 28 years from the start of that organisation in 1963 until retirement in1991. His duties included the supervision of the Veterinary Advisory Committee (VAC) which was responsible for recommending grant funding for equine veterinary research to the Board, as designated in the formation of the HBLB debated in Parliament during discussions on the formation of the HBLB and subsequently enshrined in the Act that mandated the Board’s activities. Several MPs, in particular Richard Stanley MP for North Fylde, who owned New England Stud farm, Newmarket and had personal experience of veterinary services, argued that justification for the levy rested in part upon the appropriate allocation of such funding for research. Martin played a key role in the fulfillment of the Board’s statutory objectives expressed by Stanley and other MPs in his service to the veterinary profession. He served from the start of the Board’s life until July 1991, a 28-year period without any predecessor. He had a variety of roles and responsibilities over the years but was proud of the fact that he was in charge of administrating grants for veterinary research and education throughout his entire service. At the end of his service, other areas of responsibility also included grants to horse and pony breed societies, to farriery and for vocational training of stable staff in the racing industry. He was also Secretary of the Horserace Scientific Liaison Committee, which at that time, advised the Jockey Club on doping control in racing. Martin was proud to have served under every Chairman of the HBLB and of the VAC up to his retirement; and over the span of his career to have had responsibilities under each of the statutory objective of the Board. His contribution is still recognised by many and resulted in his being made an Honorary Member of the British Equine Veterinary Association (BEVA), in 1978, President of the National Pony Society, in 1992, and the British Percheron Horse Society, in 1993. Martin was born in 1928. His parents lived near Thetford in Norfolk. When he was 9-years-old Martin was sent to Aldeburgh Lodge School, Norfolk, which moved to Orwell Park in 1938 and then, as war broke out, transferred first to Devon and then to Shropshire. In 1941, he was admitted to Eton and left in March 1946 when he joined the army as a private. After training at Ranby Camp, Retford, Notts, he was earmarked as a potential officer and transferred to the Royal Military Academy at Sandhurst. 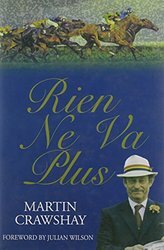 In his book, Rien ne va Plus ( ISBN 1-84104-044-4), published by the Memoir Club in 2002, Martin describes how at Sandhurst he developed a passion for gambling on horses which was to affect his life. At Eton he had started to follow racing and he used to accompany his father to Newmarket, which opened his eyes to the “rudiments of a very complicated industry” and provided first-hand experience of the systems appertaining to betting. In 1948, Martin passed out of Sandhurst as cadet number 132 of the 260 in his class and was allocated, as stated in the London Gazette Supplement (26.11.48), as a Lieutenant in the 16th/5th Queens Lancers (397216).When decommissioned in 1961, he had risen to the rank of Captain and was teased by friends that he was the longest serving captain in the British army! However if he had continued in his army career, he would have undoubtedly risen much higher. When commissioned into the 16th/5th Lancers, the regiment were at the time stationed in the canal zone of Egypt before being moved in 1950 to Barce, near Benghazi in Cyrenaica and then to Tripoli before returning to the UK for the coronation. It subsequently formed part of the British Army of the Rhine (BAOR). Martin was appointed adjutant in 1955 and served in this demanding position until just before the regiment returned to Catterick to become a training unit. An adjutant is a staff officer who assists the commanding officer and is responsible especially for correspondence, which is early evidence of the skill Martin brought to bear so well in his service to the HBLB. On the 19th March,1959, the regiment paraded at Buckingham Palace where the Queen presented a Guidon ( pennant standard of a light cavalry regiment) in recognition of the bicentenary of the 16th Queens Lancers. Martin commanded number two Guard on that parade. It was while at Catterick that he decided against continuing a career in the army but he accepted one further posting as Adjutant to Oxford University Officers’ Training Corps. In this, the objective was to recruit undergraduates which he did enthusiastically. In 1961, Martin left the army and registered his name with Weatherbys in the hope of gaining employment as an official, such as that of Clerk of a Course, Starter or Handicapper. He visited the Officers Association which specialises in finding employment for ex-officers and was informed of an opportunity to apply for a post with the newly formed HBLB. He was interviewed by Sir Rupert Brazier-Creagh at the board’s office in Euston Road and subsequently offered an appointment as Deputy Assistant Secretary at a salary of £1250 per annum, an offer he accepted with alacrity. He joined the HBLB on 25th March, 1963. Martin served under six HBLB chairmen, the first being Field Marshall Lord Harding, followed by Lord George Wigg ( five years), Sir Stanley Raymond, Sir Desmond Plummer, Sir Ian Trethowan and Sir John Sparrow. In his book, dedicated to “Grania without whose patience, encouragement and good sense, I would not have survived”, Martin recounts periods of “peace and happiness and those of trauma and anxiety”. He described the five years with Lord George Wigg as the “ first three being mainly productive and the last two steeped in controversy”. Anyone reading the book will find an enthralling summary of the politico-economic-social fabric of the racing industry of that period. The chairmanship of the VAC was held in sequence by Professor Sir William Weipers, Sir John Ritchie, Sir David Evans, Sir William Henderson and Professor Lord Soulsby. Membership included at various times that of Professor Walter Plowright FRS (renowned for his work on the eradication of the cattle plague rinderpest), Professor Tony Care, Norman Chandler, Dr John Walton and many other eminent graduates of the veterinary profession. Martin arranged regular visits made by the VAC to the University Veterinary Schools and the Animal Health Trust in order to monitor research work receiving funds from the Levy Board; and conferences every five years to allow presentations concerning the results of those studies to racehorse owners, breeders and trainers. Martin demonstrated, in the course of his career in the army and the HBLB , that he was highly capable in the administration of committees and of those who serve on them. He said what he meant and meant what he said, prepared to voice constructive advice, criticism and support, but always within the context of his office and the aims of its remit. He based his conduct of administering discussion and progress in meetings upon the strictest interpretation of the codes laid down by the governing body.